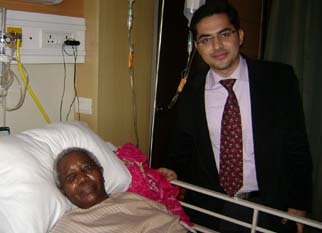 Mrs. Otuoma from Tanzania who had her total knee replacement surgery in India. I am Mrs. Otuoma from Tanzania and I came for my total knee replacement surgery in India through Forerunners Healthcare Consultants in India. I am writing this letter to let everyone know just how pleased I am with the knee replacement surgery in India arranged by Forerunners Healthcare Consultants. I was very impressed with the attentive hospital staff during my stay in India and I was extremely satisfied with the care and results of my total knee replacement surgery in India. I am so pleased with Dr. Dheeraj Bojwani as a Consultant. His professionalism and caring were deeply appreciated. My GP in Tanzania suggested me Forerunners Healthcare Consultants for total knee replacement surgery in India. During my recuperation period in the Hospital, I found the entire staff to be highly professional, attentive, and caring to my needs. This included the nurses, physical therapists, and occupational therapists. I received daily therapy in the hospital and therapy three times for a week. Within one week of surgery, I was using a walker to assist me in movement. Within the second week, I was using a cane for assistance. By the third week, I was in the swimming pool at home. Within one month, I was completely mobile and able to resume most of my normal everyday activities. I was riding my bicycle in the neighborhood. I attribute my quick recovery to following doctor's orders and actively participating in my therapy as required. Yes, there was some discomfort associated with the recuperation, but it was minimal and expected. I would highly recommend this procedure to any patient who is willing to faithfully complete the Total knee replacement surgery in India. Forerunners Healthcare Consultants came highly recommended to me and I would be happy to share my experiences with any of Dr. Bojwani’s patients who might be contemplating Total Knee Replacement surgery in India through them. Thanks to Forerunners Healthcare Consultants and Dr. Dheeraj Bojwani again for everything they have done for my total knee replacement surgery in India.